Overwatch knows that everyone loves to feel accomplished when playing a game. That’s why developers have included eight new achievements, which were partially leaked last week, for their newest event, Storm Rising. Each achievement unlocks a special spray that players can use to show they’ve completed the challenge. Eight achievements are available across two mission modes. Story mode is the version of Overwatch Storm Rising that adheres entirely to the lore of the event. Players can only select from Genji, Tracer, Winston, and Mercy. Four achievements were created specifically for this mode. Players can earn a Winston spray by completing the Story mode Storm Rising mission on Hard difficulty, the next level above Normal difficulty. The “Hot Pursuit” Tracer spray, showing her on a hovering motorcycle, is a reward for completing Story mode on Expert difficulty. Complete the Story mode Storm Rising mission on the hardest difficulty, Legendary, to unlock a spray of Genji readying himself to slice straight through a car. Tell your friends you aren’t just going to be a Mercy pocket the entire event; you need to unlock this achievement. Complete the Story mode Storm Rising mission playing each of the four heroes in any difficulty to unlock a Mercy spray. This is where the real chaos starts. “All Heroes” mode allows players to complete the standard Storm Rising mission with any hero in the game. Choose your own team composition and see which combination of heroes is best for rolling through Talon operatives. Four additional achievements are specific to this mode. Unfortunately, you can’t just instantly lock Bastion for every round of All Heroes Storm Rising. This achievement asks that you play at least eight different heroes while completing All Heroes mode on any difficulty. Players unlock a fancy Cuban car spray. Beat the Storm Rising mission in All Heroes mode on Hard difficulty to unlock a spray of Doomfist in his formal wear. It’s only one level above Normal, so it’s totally attainable. Players can unlock a spray of Talon’s omnic mastermind, Maximilien, by beating the Storm Rising mission in Expert difficulty in All Heroes mode. He looks to be scheming something, but he almost always looks like he’s scheming something. Every event, there is always one achievement that seems impossible to obtain. “Eye of the Hurricane” asks players to beat Storm Rising’s All Heroes mode on the most difficult setting, Legendary. Not only that, no “incapacitations” can happen during the entire mission. That means everyone on the team has to be in tip-top shape and a single mistake ruins the achievement. The reward is a large, colorful spray of the entire strike team participating in the Storm Rising mission. Players have only three weeks to unlock all of these achievements as well the nearly 50 new items that are exclusive to the Overwatch Storm Rising event. 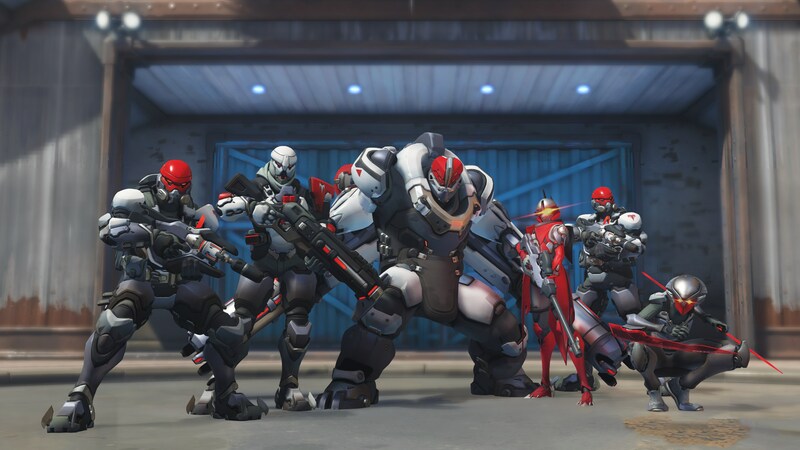 In addition, previous Archives missions, like Retribution and Uprising, are unlocked for players. All of the skins from previous Archives events are up for grabs at reduced rates, so there’s a lot to do during this event!